One of the good resolutions to be made for the New Year is for being more effective and productive. Once you become both effective and productive, you'll discover that you have enough time to do many important things. We all need some tools for our lives to be productive. One of such tools is ViprasCraft's 'YearBook' in 'LifeTools' series. In fact, this simple yet powerful tool has been tested by our team over the last year privately and because we have had incredible improvement in our productivity and efficiency levels, we wanted to present this new year gift to all our readers. This YearBook is organized into 3 important sections - 1. Roles, Goals and Habits, 2. Weekly Plan and 3. Things to Do. Roles, Goals and Habits: It is all about your brainstorming to identify and list down your important goals of the year. These shall be of short term lasting upto a few weeks, months or of long term which last for about 6 months or more up to the end of the year. You can even list the bigger goals which can be partly accomplished in a particular year. More about this section will be updated soon...... (here). Weekly Plan: Weekly Plan is about breaking down your goals, habits and other important things to do, into executable plans to be scheduled for each week independently all along the year. Unlike a day, week is the most practical unit of time which offers you enough flexibility and gives you enough time to accomplish your weekly goals. More about this to come later..... (here). Things to Do: Things to Do is the simplest but a basic fundamental thing to do to let the whole idea of YearBook work well. In this section you'll list out all activities both important and urgent, only urgent, only important, along with some unimportant issues. This is necessary because in our lives, we often encounter situations in which we need to follow up certain things even if we don't like them to do. However this 'things to do' section serves both as a backup of your activities performed in a year and also as a guide to identify important activites/things to be scheduled on weekly basis using the section 'Weekly Plan'. 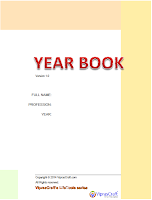 We present to you this YearBook for free in 2 PDF formats in A4 and A5 paper sizes. We provide you the instructions for printing these and other guidelines in this post ...... (here). Feel free to write to us by commenting on this page, and we take the constructive criticism well and shall strive our best to improve our services. Read the instruction manual here for both the formats - (here). Wishing you a highly successful and productive year ahead! Cheers! !